Although Balatonlelle is a small town in Somogy county, together with the two other small cities in its neighbourhood (Balatonboglár, Fonyód) forms a serious touristic attraction. 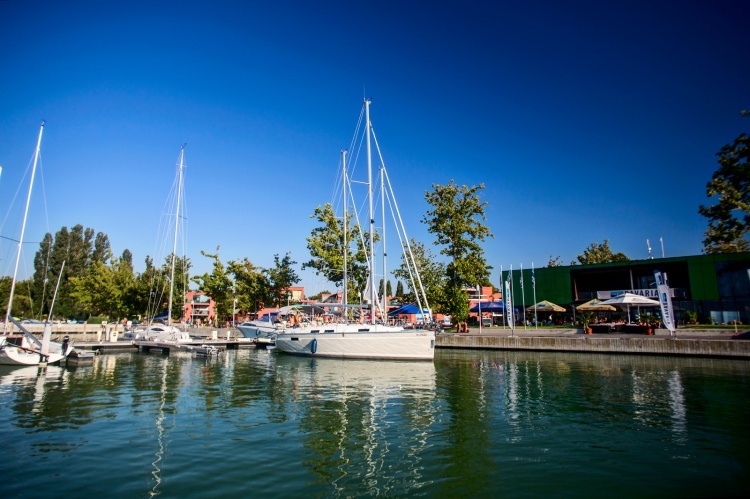 Balatonlelle is one of the most famous holiday places of the southern shore of Balaton. Pedestrian streets can be found in the centre of the city. Numerous restaurants, bars and disco places are awaiting the guests. Stores are opened until the middle of the night giving the opportunity for night shopping. The Szent István Square with its beautiful, Mediterranean-styled fountain, is the centre of Balatonlelle. At the evenings during the summer, this is the place of several theatre plays and events such as Júliális or Balatonlelle Wine Festival. A promenade leads also from the square to the pier, where the beautiful sunset can be admired, and during the day boat trips departure from here. The area became the property of the Tihany Abbey in 1211. The first written mention originates from 1229, and writes about the village under the name of Lela. Turks came to the village in 1550, after this the population decreased thoroughly: in 1580 the Turkish tax writers found only 8 families in the territory. First in the 18th century it was the family estate of the Majtényi family, then the Szalay family. School education started in 1720. From the remark of Canonica Visitatio we know that the first school building burned down. The local historical importance of the year 1848 was the acquisition of the market town rank. Next big step was the official use of the name Balatonlelle from 1864. In 1882 the town earned a higher rating: as a small village it was prompted into notarial seat (villages Boglár, Faluszemes and Őszöd belonged to it). After several decades in 1895 a two-classroom school was built which was expanded to a three-classroom school during the Commune. Studies went on here until 1938, when the currently operating bigger school building was built. In 1941-1942 the establishment of the 8 grade public school started. Post-war years brought Balatonlelle rapid recognition: in 1921 it has become a municipality and in the year of 1978 it united with Balatonboglár under the name Boglárlelle. The united municipality was considered as a city from 1986, then it separated in 1991 but both kept the town status. Napfény Beach and Water Park: The Napfény Beach and Water Park is the most popular tourist attraction of the city. In 2008 a sandy beach was formed from the sand that was dredged from the bed of the lake. It has the atmosphere of the coastline and has become the paradise of families with small children right in the year of development. The Water Park is also part of the complex, where currently 3 pools and a sauna house is operating. The pools, both for children and adults, are paved with beautiful mosaic stones, and include several equipments of entertainment. Water slide, hot tub, neck showers and massage walls are also mounted. Szent István Square: After the relaxation offered by the water park, it is worth visiting the Mediterranean-styled centre of Balatonlelle. At Szent István Square and the neighbour promenade, thousands of people gather together every evening. From this square starts the Moló promenade as well, which leads straight to the shore of Balaton. Kishegy: The Gamási-hát is part of the Külső-Somogyi Hills, stretching in north-south direction. The highest point in the outskirt of town is the top of Kishegy, which is almost 300m above the sea level. It is an excellent wine-growing area; raw materials of the famous wines of Balatonlelle are produced here. The baroque chapel called Szent Donát can be found here too, and opposite is the inn of the Jankovich family, where the visitors can get something to eat and drink, as well as they can enjoy the most beautiful panorama of the southern shore. Other attraction of Kishegy is the Park Forest. In the summer heat, the air is always refreshingly cool here, and the silence helps us to forget our everyday rush.